This is a guest post by Aaron Morris, Communication Analyst of The City of Calgary. This school year, the fun starts after the bell. 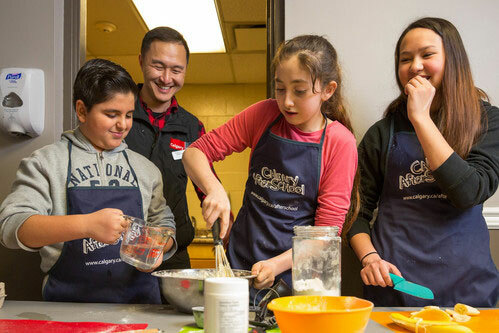 The City of Calgary is in its eighth year of providing positive, fun and supervised after school programs in recreation, schools and community facilities across Calgary. Children and youth grades 1 – 12 can drop into a weekday program in their community and take part in a variety of activities from 3 – 6 p.m. Many of the programs are free or low-cost, lowering the stress for working parents. Visit Calgary AfterSchool to find a program that’s right for you. The City of Calgary and its partners make it easy to find a free drop-in program during the after school hours with dozens of locations across the city. The program and activity offerings include homework help, swimming, skating, a variety of sports, creative arts, cooking, clubs and much more. These programs have something for everyone at every level. At Calgary AfterSchool, it’s more than just getting children and youth active. These programs are designed to help students do better in school, stay productive, increase self-esteem and teach them life skills that will follow them throughout their life. Kevin Kwasny, a Calgary AfterSchool program specialist has noticed the positive impact the program has had on its participants. Many of the kids that participate in Calgary AfterSchool develop friendships which last for years. It’s a great opportunity for them to try new experiences and activities which helps build up their knowledge, confidence.